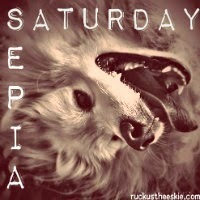 Ruckus the Eskie: Sepia Saturday #33: American Eskimo All Washed Up and Ready To Go! Sepia Saturday #33: American Eskimo All Washed Up and Ready To Go! After a long day at the beach in Carmel, it doesn't hurt to pamper Ruckus and ourselves by getting him nice and clean and free of all the sand and grit. It takes us about an hour to get him rinsed, shampooed, conditioner'd, brushed, and dried. How long does it take to wash your pup? It takes me about that for all four, mostly because I keep their coats pretty short! It doesn't take too long to wash me, but strippin me are a different story. Ruckus, you look so fluffy! We are short-haired, so we don't get fluffy! When it is warm 10 minutes with the hose but bathtime is another story LOL. Looking good Ruckus. Have a super Saturday. Looking good Ruckus! Three hours for both of us start to finish! My guys rarely get bathed. They're all too heavy for me to lift into the bath, so it's just as well they don't get a 'doggy smell' and if they roll in something stinky a bucket of warm water and soap does the job. I'd say getting you all cleaned up in an hour is really good going Ruckus! I used to have Shelties and it would have taken me about that long to wash, dry, groom etc each one. Whoa! My bath takes about as long as my Human feels like massaging me with the rubber shampoo brush. To dry we go walk in the sun. Gotta admit, you look so glamorous, just like a movie star! A very handsome movie star! That is the only thing none of us miss about living next to the ocean, the clean up. We were always getting washed off, hosed down, or given a bath. So clean and handsome, enjoy your day. You must be handsome when you're all clean and brushed, Ruckus! Looking squeeky clean and super fluffy! Momma gave me a bath just a week ago, took about an hour for me, too. My hair is pretty long right now, so it took awhile to dry and brush me! You look very handsome but that's a lot of work! I am very low maintenance, like 15 minutes! Oh, a beach in Carmel - how fabulous! I'm dying to go to Carmel, plan to make it there this Fall or Winter. Isis is a pain to bathe, I just discovered dry shampoo which is great. Phoebe's easy, plop her in the kitchen sink and 15 minutes later she's ready for her closeup! ruckus has quite a gorgeous mane, so I'm sure it's a process! Hi! I just realized my photo today is sepia so I’m linking to you. You’re looking good today. It probably takes two hours per dog (and there's two). You have to carve out a good chunk of time! Great shot! Ruckus looks distinguished. Ours both hate baths, so we never do full ones, so I don't know. Looking good Ruckus! Pretty quick here! We just toss both dogs into our large standup shower, scrub them down (all natural shampoo and conditioner) rinse with our removable shower head and towel dry! Ta da!